Istria is westernmost part of Croatian coast, with an area of 2,800 square kilometers Istrian peninsula is largest one on Adriatic. Istria have around 450 km long coastline covered with pine forest and distinctive green macchia vegetation which consists mainly from strawberry trees and mediterranean oak. Due to vicinity of central Europe, mild mediterranean climate with lush greenery springs, color abundant autumns, pleasing summers and gentle winter temperatures as well as long tradition of tourism, Istria is become premier holiday destination in Croatia. As a true gem of Croatia tourism, Istria certainly has a lot to offer to its visitors. Well preserved and protected natural phenomena of Istrian peninsula are just one of the many advantages that tourism in Istria has to offer. Sun-bathed hills of inland decorated with blossoming Mediterranean nature, rugged coastline with numerous hidden coves, large and small bays, picturesque islands and islets, unspoiled istrian beaches as well as turquoise blue clear sea in combination with rich Mediterranean cuisine and friendly hosts will certainly make you back in Istria for your holidays. Pula is largest city on Istrian peninsula and administrative center of Istria region. The city is crowded with cultural and historical sites where one stands out among the others; Arena is perfectly preserved Augustan Roman amphitheatre located in a heart of Pula. Arena stands out in the local surrounding and serves as a venue for summer concerts and festivals. Just couple minutes of bus ride to the south you can find several beautiful beaches located on Verudela peninsula. 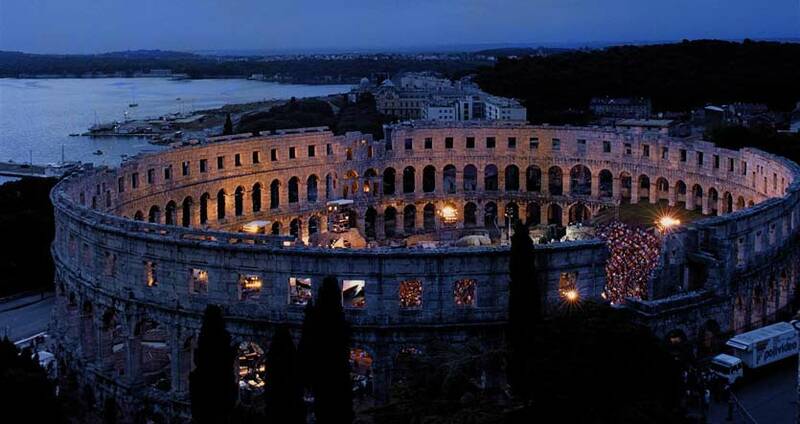 Main attractions and tourist resorts of Pula are located just couple minutes outside city center. Pula promenade is full of cafes and restaurants with local traditional cuisine. 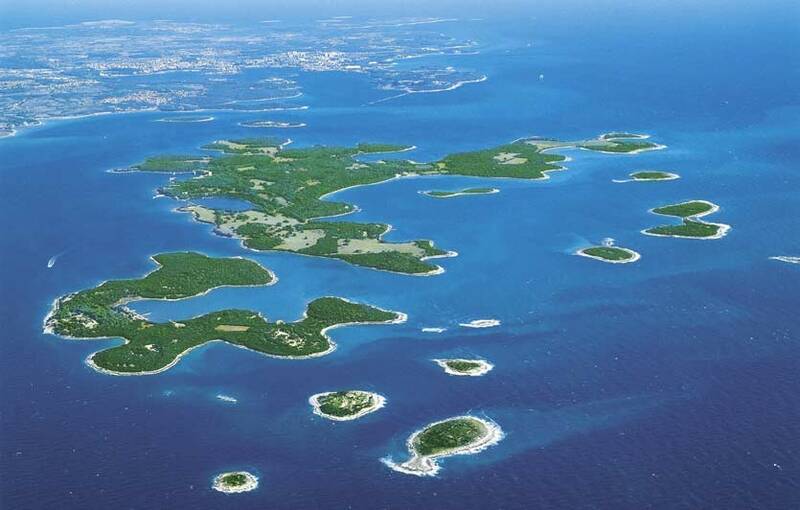 Further to the south of Pula along the indented coastline, Premantura Peninsula hides a noteworthy Kamenjak nature park. Rovinj is modern tourist resort which comprises best sides of Istria. Town is third popular holiday destination on Istrian coast just behind Pula and Porec. The city of Rovinj is one of picturesque holiday destinations on Adriatic. In past day used to be a town oriented on fishing but today modern Rovinj is famous destination in Croatia. Center of all happenings is town core where are most of bars, art galleries and restaurants are located. If you’re a fan of Mediterranean cuisine, fish,seafood or fresh fruit and vegetables we advise you to visit Farmer’s market, located at the edge of the town, near Valdibora Square. Porec (lat. Parentium) is a town situated on the west coastline of Istria. This is 2000 years old town has been built in a sheltered harbor protected from seaside by St. Nicholas Island. By visiting Porec you can still see the ancient Roman structure of town, there are town main streets Decumanus and Cardo Maximus preserved in their original form, temple devoted to Roman god Neptune built in 1-st century AD and finally main attraction is Euphrasian Basilica in Porec which dates back in 6th century. Euphrasian Basilica is under protection of UNESCO as a world heritage site since 1997. Umag is another popular holiday destination town on west coast of Istrian peninsula. Umag riviera taking about 20km of coastline with numerous scenical bays and well preserved natural beautys. In its tourist offer Umag have about 60.000 beds in luxury hotels, apartments and villas in private arrangement. If you are looking for cheaper holiday alternatives Umag has many high quality camping sites scattered along the coast of Umag riviera. Beside high quality accommodation Umag can offer you :stunning awarded beaches, big number of historical sites, unspoiled nature and vicinity of other European countries. National Park Brijuni Islands – protected area of fourteen different islands: Galija, Gaz, Grunj, Jerolim, Kozada, Krasnica (Vanga), Madona, Mali Brijun, Okrugljak, San Marco, Supin, Supinic, Vrsar and Veliki Brijun. Island Veliki Brijun is the largest and it is situated about 2km from the coast, separated from the mainland by narrow Fazana Strait. Brijuni archipelago are premium destination and perfect spot for business tourism, special conferences and congresses due to tradition of providing an high quality service. Lim Bay – tourist attraction and protected natural site which is also a place where oysters and fish farms of gilthead and sea bass are cultivated since ancient times. Bay is 12 km long and up to 500 meters wide unusual natural phenomenon. Lim bay strangely resembling on fjords in Norway although, its genesis is not the same as fjord, it is probably made by the former river flow of the Pazincica which is today an underground river. Ucka – highest peak of Istria was declared as a nature park, due to natural diversity and the fact that is the habitat of several protected plant and animal species. Ucka visually excels Istria and Kvarner Bay. Ucka nature park covering area of 160 km2. Climbing on its highest spot Vojak on 1402m above sea level will offer you a stunning panorama on whole Istrian peninsula, Istrian and Kvarner islands, mountain peaks in region of Gorski kotar, and all the way to Venice and the Alps. Motovun Forest – lies alogn riverbed of Mirna river. Motovun represents the last remnants of “longoze” – native forest vegetation of humid lowlands. Worldwide there are only three more location with such vegetation. Motovun vegetation is made of red oak, common hornbeam, narrowleaf ash, lowland elm, and many climbing plants (traveler’s joy, wild grape, ivy…), and it is a home of “Rana latastei” – very rare brown frog. Forest area spreads on over 900-ha on alluvial terrain of Mirna river. Palun – small sheltered bay which is also only ornithological reserve in Istria. Plaun is situated 8 kilometers to the southwest of Rovinj. This natural depression in vicinity to the Adriatic sea made by water inflow from surrounding hills and many springs has turned into a swamp. In 1906 there was military base in local Barbariga and in a purpose to increase salinity of water and to prevent malaria and growth of mosquito larva, army made 200 meters long canal which connects sea and swamp. After that happened swap gained its new residents like grey mullet, eels and migratory bird species what is the most important feature of this natural phenomenon.